South Africa will play India on Friday in Twenty20 match of ICC world cup 2014, hosted by Bangladesh. South Africans have been practising hard in the nets against spin bowling. So far in this tournament Indian spinner has taken lot of wickets and won most of the man of the match awards. Shane Warne has been involved in some net sessions with South Africans, offering his advice to Imran Tahir and helping batsman. Amit Mishra will be a big threat, he has been man of the match twice in 4 games. Hashim Amla has played well in last 2 matches with a good strike rate that has stopped criticism about his batting capabilities in shorter format of cricket. 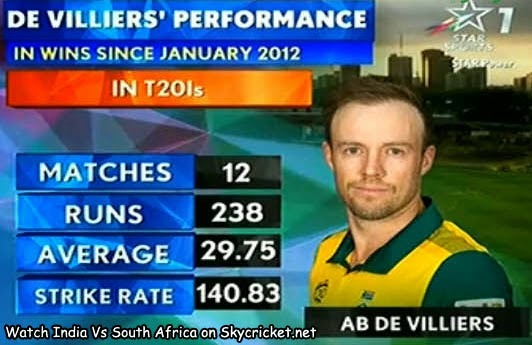 Ab de Villiers and JP Duminy play good against spinners and these 3 batsman usually play at top of the order. If they can keep wickets and get enough runs on the board then rest of batsman can follow their footsteps because of less pressure. What if India play three quality spinners? if they do so then South African batting might collapse in a similar way to Pakistan. Indian spin attack is no doubt the best so far, Indian batsman didn't have to worry about chasing any good total. All teams has scored in excess of 170 runs in this tournament, how ever India hasn't scored big totals but still won matches comfortably because of their bowling. If India is asked to bat first, will they be able to put a big total on the board? South Africa hasn't won a title in last 16 years and this is a golden opportunity for team to win ICC World Cup. He has played 12 matches and made 238 runs with an average of 29.75 and strike rate of 140.83. If he can put on a good score then no doubt South Africa will be in good position to win the match. Amit Mishra has been man of the match twice in 4 matches of ICC World Twenty20.